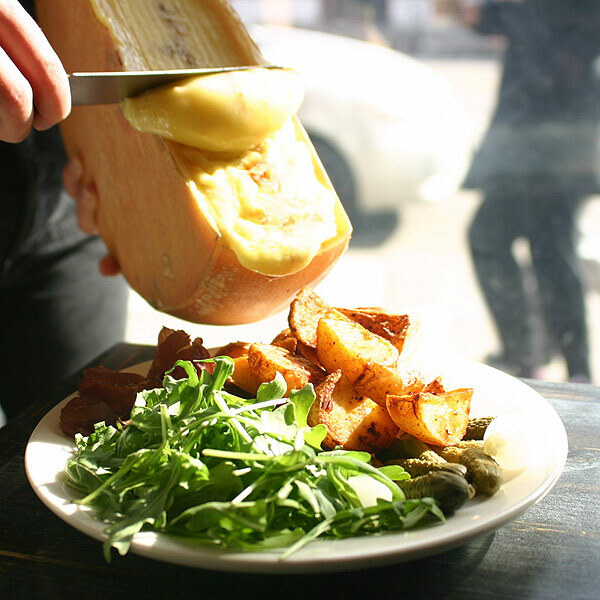 You’ve probably seen Raclette’s viral video on facebook or instagram and watched that gooey, delicious, melty cheese being scraped from a cheese wheel onto a plate of meat, hamburger, sandwich or veggies, activating your taste buds as they jump for joy and build the anticipation of eating at Raclette exciting enough to actually make the trip. I had seen the advertisement for this place, and as a lover of cheese, felt enamored with this place. The idea of rich gooey cheese all over my meal sounded insanely satisfying, so when a friend of mine got a group of us together to eat dinner here, I was very excited. The place was small and camped. It felt very French in that way. Small seats, tightly packed tables. Like a small french cafe you’d find in Paris. Because we were a larger party (8) we were sat at one of their booths in the back. The seats, a bit short for my taller friends, who felt like they were sitting on a shelf all night long. I was lucky to be sitting in a proper chair. The table was barely big enough to fit all out plates. 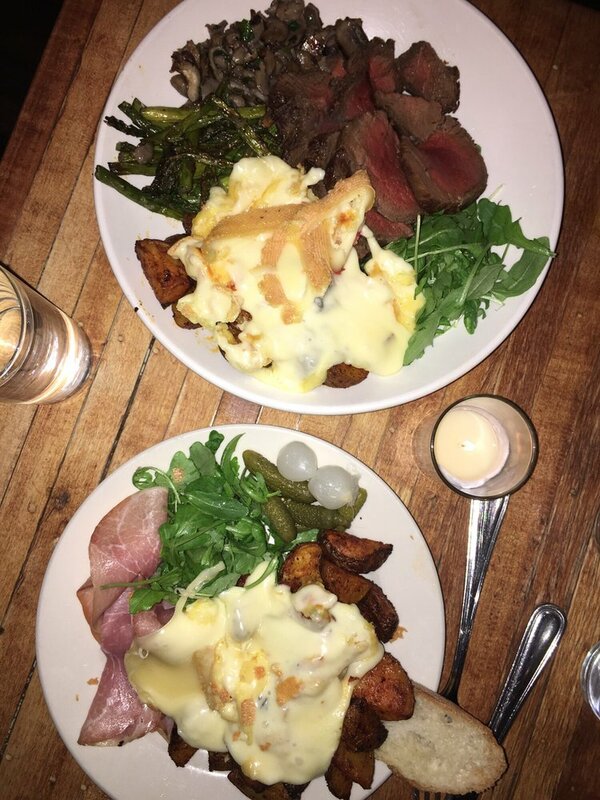 Looking through the menu, a few things jumped out – Croque Monsieur, Lolotte, Raclette Burger, Mac and Cheese, etc.. I went for the Raclette Burger, while my friends got various items and we shared. How it works: Anything from the “Raclette” portion of the menu, will have the famous *raclette cheese scrape over the plate. You’ll get to choose which type of cheese scrape you prefer. There’s a separate menu for this. They have a base cheese that has no additional charge, and then other types that cost a few dollars extra. I had the truffle cheese, which turned out to be the best choice of the other scrapes we tried. The food, unfortunately, didn’t live up to the hype. Under the rich gooey cheese scrape, was a mediocre burger that lacked any personality. I felt equally disappointed with the other dishes I tried. 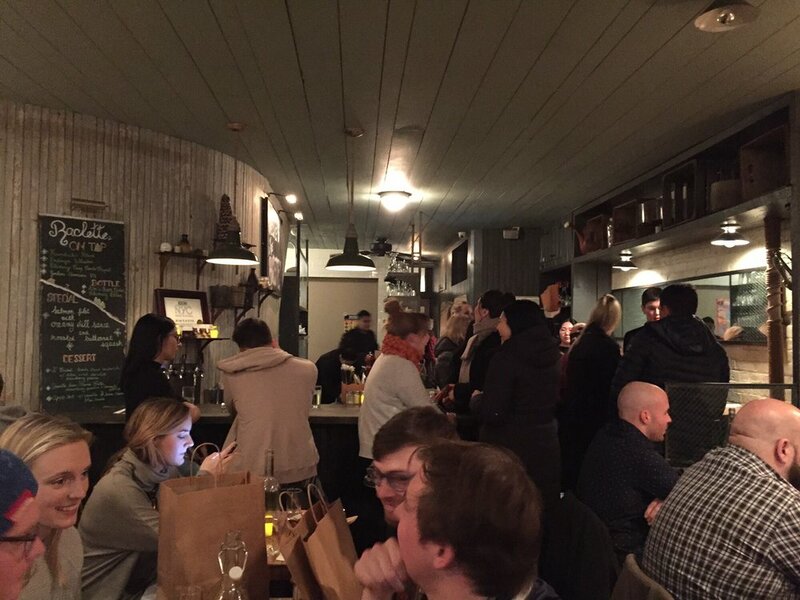 Though their Mac and Cheese was pretty darn good, as well as their Cauliflower Tartine. The cheese melt was good, but not good enough to justify the cost of the entire meal. It certainly didn’t save the dish or do it any favors. I left feeling unsatisfied, my wallet emptied, and stomach stuffed with rich heavy dairy that took about two days to fully digest. The video may make it look spectacularly delicious, but unfortunately, my trip there wasn’t what I had hoped it would be. 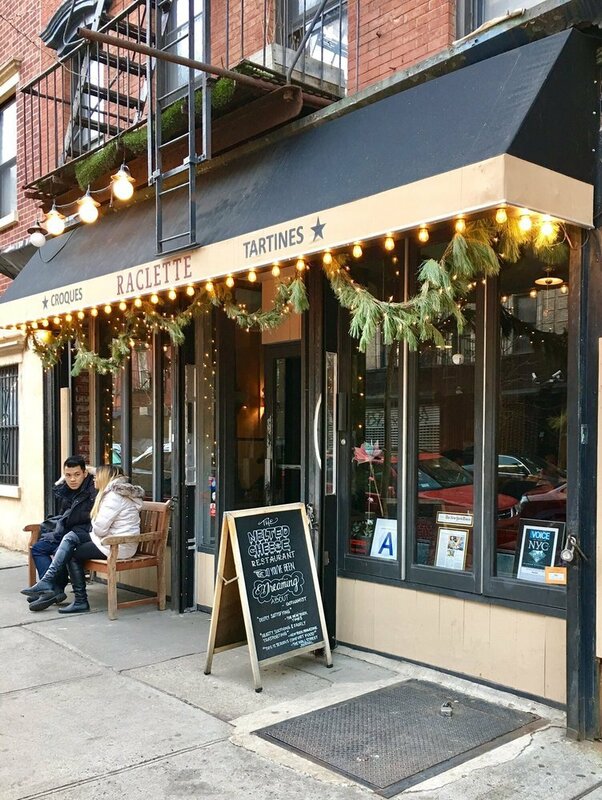 Raclette is the East Village’s popular little french cheese spot and is located on 12th St between Avenues A and B.